Lemon Tree City Centre is close to Signature Towers, Unitech Business Park and the capital New Delhi. It offers a range of free services, a business center, and a gym. Lemon Tree Hotel City Centre provides well-furnished guest accommodations, LCD TVs, personalized room service, mini bar with 2 complimentary bottles of packaged drinking water provided daily. When dining, guests can enjoy an eclectic all-day dining experience with Indian, European, American and pan-Asian cuisines, and some special home-grown recipes. Located in up-and-coming Gurgaon, Lemon Tree Hotel Udyog Vihar offers modern rooms with flat-screen TVs. It features fitness and business facilities and a cafe with Indian, Western and Asian menus. Featuring bright interiors, air conditioned rooms come with ironing facilities, an armchair and a fridge. Heated showers and a hairdryer are available in private bathrooms. Guests can explore Delhi’s sights with help from the tour desk. The staff can provide room service and attend to laundry needs. Lemon Tree Udyog Vihar offers direct access to the NH8 expressway and is a 20-minute drive from Indira Gandhi Airport. It provides car rental service and free parking. Crowne Plaza Today Gurgaon is across from Signature Towers, about 12 miles from New Delhi. The hotel features a free city shuttle, a pool, 2 dining options and free parking. The air-conditioned guest rooms come equipped with a flat-screen cable/satellite TV, DVD player and personal safe. A minibar and tea/coffee maker is provided. Crowne Plaza Hotel features a fitness center, beauty salon and massage services at the spa. A tour desk and babysitting services are available. Café G provides an international menu and buffets. WildFire Restaurant serves Brazilian specialties. Drinks are available at the 24-hour Connexions Bar & Lounge. 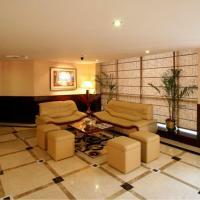 Crowne Plaza Today Gurgoan is a 30-minute drive from Indira Gandhi International Airport. Gurgaon Train Station is about 5 miles away. Centrally located in Gurgaon's business district, the hotel features a fitness center and rooms with a flat-screen TV. Ibis Gurgaon also houses a restaurant and bar. Ibis Gurgaon is 3 miles from shopping and dining options along Mehrauli Gurgaon Road. The Indira Gandhi International Airport is 12 miles away. With the choice of outdoor dining, Spice It Restaurant serves Indian, Oriental and European dishes. Refreshments are available at the bar. Fitted with hardwood floors, modern rooms are equipped with a TV with cable channels and a private bathroom with a hairdryer. Tea/coffee making facilities and a minibar are also provided. Car rentals and a baggage storage service are available at the 24-hour front desk. Wi-Fi is available throughout the hotel at a fee. Courtyard by Marriott, Gurgaon is near New Delhi, a 3 hour drive from the Taj Mahal. The hotel features a spa, an outdoor pool and 4 dining options. The air-conditioned rooms come with a cable TV, DVD player and minibar. Personal safes and private bathrooms are provided. The hotel features a business center, dry cleaning services and a tour desk. There are golf courses within 2 miles of the hotel and car rentals available. International cuisines are available at MoMo Café, while MoMo2Go offers quick bites. Asian specialties are available at Red Zen Restaurant, and the chic contemporary Bar Zen offers a range of drinks. 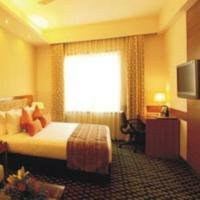 Courtyard by Marriott, Gurgaon is approximately 9 miles from Indira Gandhi Airport. Park Inn Gurgaon is located in central Gurgaon, 4.3 miles from Leisure Valley Park. The hotel features a swimming pool and rooms with 32” flat-screen TVs. Free parking is available. The spacious rooms at Gurgaon Park Inn feature hard hardwood floors and floor-to-ceiling windows. Rooms are brightly lit and are equipped with a safe, minibar and tea/coffee maker. Recreational activities include taking a dip at the rooftop swimming pool and working out at the fitness center. The hotel provides laundry and currency exchange services upon request. Sightseeing arrangements can be made at the tour desk. Guests can have their meals at the restaurant, which serves a variety of dishes. The restaurant provides all-day dining. Park Inn Gurgaon is central Gurgaon is 6 miles from Delhi Indira Gandhi International Airport and 5 miles from Ambience Mall. Located in the heart of Gurgaon District, Optus Sarovar Premiere features an outdoor pool, 4 dining options and free parking. Each room offers flat-screen TV and DVD player. 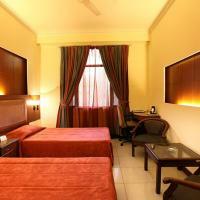 Rooms at Optus Sarovar are also equipped with air conditioning, private bathroom and a safe. Bathrobe and slippers are also provided. Guests can also make use of the tea/coffee maker and a minibar, which are available in all rooms. Bistrot restaurant features a variety of meals in fine dining setting. The hotel’s signature restaurant – The Oriental Blossom – serves authentic local and Oriental dishes. Barbecued delights can be enjoyed at Skewers restaurant, which features rooftop dining. Snacks and drinks are also available at the hotel’s lobby lounge. Guests of Optus can use the business center or work out at the health club. They can also buy souvenirs for loved ones at the hotel’s gift shop. Optus Sarovar Premiere is 9 miles from Indira Gandhi International Airport and 11 miles from Palam Domestic Airport. Ramada Hotel Gurgaon features rooms with radio, free Wi-Fi and LCD cable TV. Guests can rejuvenate at the sauna and jacuzzi, or take a refreshing swim in the pool. Located in the heart of Gurgaon, Hotel Ramada is a 20-minute drive from IGI International Airport. Medicity is a 5-minute drive away. Rooms at BMK’s Ramada are equipped with minibar, tea/coffee maker and safes. Guests can work out at the fitness center. Free indoor parking is available in the hotel. The hotel offers a 24-hour cafe and room service. 220 yards from the Universal Trade Tower, Fortune Select Excalibur offers modern 4-star accommodations with flat-screen TVs and free private parking. It features a fitness center, spa and outdoor pool. Excalibur Fortune Select is 13 miles from Indira Gandhi International Airport and 22 miles from New Delhi Train Station. Rooms feature city or pool views and hardwood floors. Guests enjoy free internet access for 2 hours. Modern rooms are equipped with cable TV, a DVD player and laptop safe. Fortune Select Excalibur has a business center, a bookstore and salon. A tour desk with ticket service offers help with trip planning. The staff is available at the front desk throughout the day and offer concierge service. A 24-hour coffee and pastry shop is available who want a midnight snack. Other dining options include an Indian restaurant and a bar offering refreshing cocktails. Featuring a world-class spa and large outdoor pool with jacuzzi, The Bristol offers luxurious 5-star rooms with spacious layouts. Offering free Wi-Fi and parking, it has a restaurant and stores. Fitted with classic wood furnishings, air-conditioned rooms have cable TV and a DVD player. Guests can enjoy the convenience of a safe, ironing facilities and tea/coffee making amenities. Regular workouts can be maintained at the well-equipped fitness center. After a day of activity, relaxing massages and ayurvedic treatments await at the spa. The Bristol Gurgaon offers business and transportation services. A 24-hour coffee shop serves local specialties and international meals, while Peppers Discotheque offers light refreshments. Room service is available. The Bristol Hotel is within walking distance of the DLF Outlab Enclave in Gurgaon. It is 9 miles from Indira Gandhi International Airport. Located just 2 miles from Gurgaon Central, Emblem Hotel features rooms with free Wi-Fi and a flat-screen cable TV. The hotel offers a 24-hour cafe, car rental and concierge services. Hotel Emblem is 3 miles from DLF Cyber City. New Delhi Train Station is 19 miles away. The hotel is less than 9 miles from Delhi International Airport. Rooms at Emblem feature a radio and tea/coffee maker. Safety deposit boxes and ironing facilities are available. Sightseeing arrangements can be made at the tour desk. Laundry services are available. The hotel has a 24-hour cafe which offers authentic Indian, European and Chinese cuisine. Round-the-clock room service is also available. Peaceful stays await at Best Western Skycity Hotel with its spa facilities and plunge pool. Offering free Wi-Fi and parking, it is a 20-minute drive from Indira Gandhi International Airport. Quiet soundproofed rooms offer the comfort of classic wood furnishings and carpeted floors. Guests can enjoy a drink from the minibar while watching satellite channels on the flat-screen TV. Located in the heart of Gurgaon, Skycity Hotel Gurgaon Best Western is within a 15-minute drive from most landmarks in the business district. It is a 5-minute drive from the shopping malls at MG Road. Get a good workout at the well-equipped fitness center. Alternatively, explore the sights of Delhi with help from Best Western Gurgaon’s tour desk. A 24-hour business center is available. A range of Western, Chinese and Indian specialties is available at the 24-hour coffee shop. Other dining options include a rooftop bar and pastry shop. A 5-minute walk from Delhi Metro Station, Justa The Residence Gurgaon offers rooms with satellite TV. It features a restaurant, free parking and is located across from the Global Business Park. Each room at Justa The Residence comes with modern furnishings and hardwood floors. A minibar, safe and tea/coffee maker is provided. The hotel offers travel and ticketing services. Laundry services are also available. An American-style buffet breakfast is served at the on-site restaurant. Other dining options include local, European and Chinese dishes. Justa The Residence Gurgaon is located next to the DLF Corporate Park in downtown Gurgaon. It is a mile from Cyber Greens and 4 miles from Indira Gandhi International Airport. Located in the heart of Gurgaon, Ramada is a 20-minute drive from Indira Gandhi International Airport. It offers an outdoor pool and 3 dining options, including a 24-hour coffee shop. Fitted with wooden flooring, modern rooms feature a private bathroom and a seating area and flat-screen TV. 24-hour room service is available, while Wi-Fi is accessible at a fee. Ramada Gurgaon Central is 1.7 km from Unitech Cyber City and 5 km from Udyog Vihar. It is within a 30-minute drive from Manesar and Sohna towns. Damdama Lake is 9 km away. Café Rouge serves Indian, Continental and Lebanese dishes round-the-clock. The Oriental Pearl Restaurant offers Asian dishes, while Cellar Bar Lounge features drinks and light snacks. Guests can exercise in Ramana Gurgaon’s gym or use the business centre. They can also make travel arrangements at the tour desk. Free parking is provided. Featuring elegant rooms with flat-screen TVs and free Wi-Fi, Hotel Bizzotel’s 4-star amenities include a fitness center and outdoor pool. Providing free parking, it is situated in Gurgoan’s city center. Boasting city views and classic wood furnishings, Bizzotel’s air-conditioned rooms offer the convenience of ironing facilities and a safe. A minibar and free tea/coffee making amenities are also provided. Private bathrooms with a bathtub and hairdryer. Travelling around New Delhi is easy with the tour and shuttle services provided. The staff at the 24-hour reception can assist with business and laundry needs. A range of Indian specialties and Japanese dishes can be sampled at Gola Sizzlers. Meals can also be served in rooms. 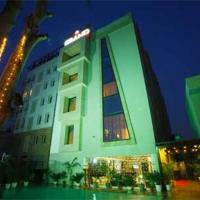 Hotel Bizzotel Gurgaon is 2 miles from MG Road Metro Station and 11 miles from Indira Gandhi International Airport. Bizzotel is in Gurgaon, 2 miles from the MG Road Metro Station. The stylish hotel offers a spa, an indoor pool and a gym. Free parking and Wi-Fi are provided. The cozy rooms at Bizzotel offer a flat-screen TV, a minibar and tea/coffee making facilities. Each room has a private bathroom with a bathtub. Grand Bizzotel offers a business center with fax and photocopying services. To relax, guests can enjoy a workout at the gym or swim in the indoor pool. The hotel’s restaurant serves buffet breakfast and international dishes. Japanese food is also available. The Grand Hotel Bizzotel is a 30-minute drive from Indira Gandhi International Airport. The hotel is also close to the Sohna’s hot water spring and Damdama Lake. Five-star luxurious accommodation with free Wi-Fi is provided at Pullman Gurgaon Central Park, located within the corporate city of Gurgaon in New Delhi. Pampering spa treatments, a heated outdoor pool and fitness centre are available. Enjoying city views, the contemporary and spacious rooms are fitted with a flat-screen TV, an iPod dock and a DVD player. A minibar and tea/coffee making facilities are included. En suite bathrooms come with a separate rainshower and bathtub. Pullman Gurgaon Central Park is 18 km from New Delhi International Airport. It is 28 km from New Delhi Railway Station. The 24-hour Sen5es Restaurant serves international cuisine, while Citrique Bar offers cocktails and tapas in a stylish setting. French and Italian cuisine including fresh seafood are featured at La Riviera. Day trips and car rentals can be arranged at the tour desk. The hotel also provides a business centre and laundry services. A 24-hour front desk and free parking are available. Jukaso IT Suites is located in central Gurgaon, just 2.2 km from MGF Metropolitan Mall. Enjoying peaceful surroundings, it offers free Wi-Fi. Fitted with hardwood flooring, the air-conditioned rooms at Jukaso IT feature a flat-screen satellite TV and tea/coffee making facilities. The en suite bathroom is equipped with hot shower facilities. Jukaso IT Suites Gurgaon is a 15-minute drive from Indira Gandhi International Airport. Guests who drive can enjoy free parking. Guests may make arrange a day trip at the tour desk, or make use of the 24-hour room service should they choose to stay in. The hotel also provides laundry services and a 24-hour front desk. The on-site restaurant hosts a 'live show-kitchen' serves a selection of Indian, Italian, Thai, Vietnamese, Cambodian, Continental and Japanese dishes. A breakfast buffet is also available. Drinks can be enjoyed at the courtyard bar. Hotel 32nd Milestone is along the Delhi-Jaipur Highway, 3 miles from Gurgaon Bus Station and Gurgaon Train Station. It has 4 dining options, a bowling alley and a shooting range. Featuring hardwood floors, the air conditioned rooms at 32nd Milestone come with a flat-screen TV. Each room also has a minibar and a work desk. The private bathroom provides herbal toiletries and a bathtub. Recreational activities at the hotel include trampoline bungee jumping and go karting. Guests can also play cricket and billiards, or exercise in the gym. The hotel provides concierge service and currency exchange. Buffet breakfast is served daily. India House Restaurant offers Indian, Chinese and continental dishes. Mediterranean and Italian specialties are prepared in Café Mamma Mia’s wood-fired oven. There is also a 24-hour coffee shop and ice cream and pastry cart. Driving from 32nd Milestone to New Delhi International Airport takes 30 minutes. Located 2.5 miles from the heart of central Gurgaon, Country Inn and Suites features a health club and full spa. It also offers free Wi-Fi and free parking privileges. Country Inn and Suites By Carlson Sec-12 is 2 miles from Chowk Metro Station. It is within 9 miles from Damamdama Lake and Indira Gandhi Airport. Modern rooms are decorated in soothing light browns, and come equipped with a flat-screen TV offering cable channels. Safes and tea and coffee making facilities are provided. Guests can take a refreshing swim in the pool or work out in the fitness center. The hotel has a business center offering fax and photocopying services. Its tour desk assists in car rentals and currency exchanges. Mosaic is a 24-hour coffee shop offering an array of light bites. Drinks can be enjoyed at 60ml bar. Lemon Tree Hotel is in the center of Gurgaon, half a mile from Kingdom of Dreams. It features a pool and spa. The hotel also offers a gym, restaurant and bar. Lemon Tree Hotel, City Center North, Gurgaon, is 1.5 miles from Sahara Mall and MGF Metropolitan Mall. Indira Gandhi International Airport is a 25-minute car ride away. Modern rooms are fitted with a DVD player and flat-screen TV offering cable channels. Free Wi-Fi is available for 30 minutes per room. The daily newspapers and mineral water are also provided. The hotel has a business center and tour desk. Currency exchange and laundry services are available. Guests can also enjoy a game of pool in the hotel. Citrus Café specializes in all-day international delights while drinks, games and music are featured at Slounge. The Avenue by Seasons Hotel offers boutique rooms with free Wi-Fi in central Gurgaon City, just opposite Sahara Megamall. Offering a 24-hour front desk, it also has free parking and a restaurant. Fitted with wooden flooring, air-conditioned rooms feature contemporary decor and a flat-screen TV. A minibar and tea/coffee making facilities are included. Attached bathrooms have a hairdryer and shower facilities. The Avenue by Seasons Hotel is a 2-minute walk from Centra Mall. It is within 5 km from the business hubs of Infinity Centre and Cyber City. Daily newspapers and luggage storage service are provided at the reception. The tour desk can help to arrange day trips, while the business centre takes care of guests' professional needs. The on-site restaurant serves Indian and Continental dishes, as well a daily buffet breakfast. In-room dining is available with room service. Located in Gurgaon’s business district, Quality Inn Bliss is a 5-minute walk from Signature Tower. It features 2 dining options and rooms with a flat-screen TV. Free Wi-Fi and parking are provided. Rooms at Bliss Quality Inn come with modern décor and large windows that offer plenty of natural light. Included in each room is a minibar and personal safe. 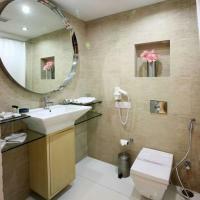 Shower facilities and toiletries are also provided. With a 24-hour front desk, the hotel offers car rental and currency exchange services. Sightseeing and travel arrangements can be made at the tour desk. The restaurant serves a variety of local and international dishes. Refreshing beverages and outdoor dining options are available at the Lounge Bar. Quality Bliss Inn is 10 km from Gurgaon Railway Station and 15 km from Indira Gandhi International Airport. Occupying a central spot in Gurgaon, 1589 City Mark Hotel, Gurgaon features a rooftop spa, an outdoor pool and a business centre. It is within 2 km from Galaxy Malls, Maruti and Iffco Chowk. Medicity Hospital and Huda City Centre Metro Station are 3 km away. Featuring a 32-inch flat-screen TV, air-conditioned rooms offer modern interiors and comforts like a tea/coffee maker, welcome drinks and bottled water. A safe and hairdryer are provided. 1589 City Mark Hotel Gurgaon is 12 km from Indira Gandhi International Airport and 14 km from Indira Gandhi Domestic Airport. It provides airport transfers and free parking. Regular workouts can be maintained at the fitness centre. Added conveniences include a 24-hour front desk and room service. A hearty buffet breakfast is served at the restaurant, which also offers varied international and Indian menus. The Perch offering serviced apartments in Gurgaon’s business district. Situated 15 km from Indira Gandhi International Airport, it features a rooftop restaurant, free parking, and free Wi-Fi throughout the property. Air-conditioned apartments at The Perch include a kitchen with a stove, microwave and fridge. A flat-screen TV and a washing machine are also provided. Private bathrooms have shower facilities. Guests can exercise in the fitness room, or play a game of table tennis. The tour desk provides concierge and taxi services. Fax/photocopying and laundry services are also available. Local and international dishes are served at the rooftop restaurant. Guests can also order room service. The Perch is a 5-minute drive from Medicity and Fortis hospitals, and 1 km from HUDA Metro station. Fronted by a private garden, Lamba's House - DLF Phase 2 offers homely air-conditioned rooms with a flat-screen cable TV and free Wi-Fi. It provides hearty buffet breakfasts and 24-hour room service. A safe, minibar and tea/coffee maker are standard in all rooms. They come with classic wood furnishings, a vanity and a private bathroom with a bathtub or shower. DLF Phase 2 Lamba's House is a 15-minute drive from Indira Gandhi Airport and Delhi's domestic airport. UNESCO World Heritage site, Qutub Minar is 11 km away. Ambience Mall is a 5-minute drive. Guests can explore India’s attractions with help from the tour desk or with a hired car. 24-hour reception, same-day laundry service and free parking are available. Indian specialities, as well as Chinese and European dishes can be enjoyed at the cosy restaurant. In-room dining is possible with 24-hour room service. Ahuja Residency is located in DLF city, Guragaon, less than 3 km from MGP Metropolitan Mall, DLF City Centre Mall and Sahara Mall. Offering fully furnished rooms, the property provides 24-hour room service. Featuring both a ceiling fan and air conditioning, modern rooms all have a satellite TV and small seating area. A minibar and personal safe are included. Attached bathrooms come with hot water showers. 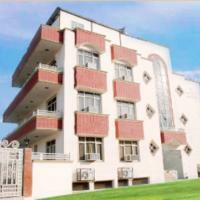 Ahuja Residency is about 12 km from Indira Gandhi International Airport. Free parking is available on-site. Basic business services such as fax and photocopying are available at the 24-hour front desk. 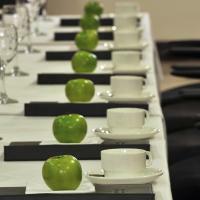 The hotel also provides meeting rooms and laundry services. The hotel's restaurant has an à la carte menu offering local dishes. Ahuja Residency Gurgaon Service Apartment offers modern self-catering units with free internet access in Gurgaon’s city centre. Offering 24-hour room service, it boasts an outdoor pool, fitness and laundry facilities. Ahuja Residency Gurgaon is within 3 km of popular shopping options like MGP Metropolitan Mall, DLF City Centre Mall and Sahara Mall. It is 12 km from Indira Gandhi International Airport and provides free parking. Cable TV, comfortable lounge and dining areas and full kitchen facilities are a standard in all apartments. They offer dark wood furnishings and pleasant neutral shades. Added conveniences include a 24-hour front desk and a restaurant serving hearty local meals. Located a 15-minute drive from Delhi International Airport, Ahuja Residency Park Lane Gurgaon offers modern rooms with free internet access and a flat-screen TV. Free parking is provided. Ahuja Residency is a 30-minute drive from Delhi City Centre. DLF Mega Mall is 1.5 km from the hotel, while MGF Metropolitan Mall is 2.7 km away. With touches of reds and browns, rooms provide cable TV channels and tea and coffee-making facilities. An ironing board and hairdryer are available on request. Bathroom toiletries are offered. The hotel has a 24-hour front desk, while its tour desk assists with sightseeing arrangements. Laundry can be done in the hotel. Meeting rooms are available for use. Guests can enjoy a selection of international meals and light snacks throughout the day in the dining room. Centrally located in Gurgaon’s business district, Hotel The Clover offers accommodation with floor-to-ceiling windows and a rainshower. It features a fitness centre, restaurant and free parking. Rooms at Clover come with modern décor and wooden flooring. All have plenty of natural light, and are fitted with a TV and minibar. Toiletries are provided in the en suite bathroom. Guests can enjoy a variety of local, Chinese and Italian dishes at the restaurant. In-room dining options are available upon request. With a 24-hour front desk, the hotel provides car rental and airport shuttle services. Laundry and dry cleaning services are also offered. 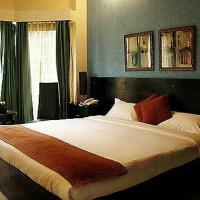 The Clover Hotel is 6 km from the Sultanpur Bird Sanctuary and 20 km from Indira Gandhi International Airport?. This hotel, located in Gurgaon, is less than 2 km from local shopping malls and 4 km from DLF City Centre Mall. A fitness centre, free Wi-Fi and a 24-hour front desk is featured on site. 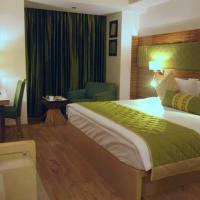 Hotel Crossroads, Gurgaon offers modern, air-conditioned rooms with wooden floors and white linens. Each one has a flat-screen TV with satellite channels and a tea/coffee maker. At the contemporary restaurant, guests can enjoy Indian and international cuisine. There is also a rooftop restaurant offering city views and a chic coffee lounge which serves refreshing beverages. Guests travelling by car can benefit from the free private parking at the Hotel Crossroads. 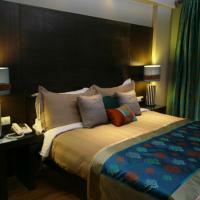 Located in DLF Phase-I, Gurgaon, Woodbridge-1 Crossroads offers spacious rooms with free Wi-Fi. Just a 2-minute walk away from the shopping malls of M.G Road, it features free parking. Woodbridge-1 has modern rooms with wooden furniture and marble floors. Each of the air-conditioned rooms has a flat-screen cable TV, a work desk, and a private bathroom with a hairdryer. Guests can start their day with a breakfast buffet, before exploring the surrounding area. Some rooms have a fully equipped kitchen and the hotel’s 24 hour room service offers local dishes. Indira Gandhi International Airport is a 30-minute drive away from the hotel. A car rental service and a tour desk are also available. Located in the residential area of DLF Phase-I, Woodbridge-2 Crossroads hotel is a short 2-minute walk from the shopping malls of M.G. Road. It offers 24-hour room service and rooms with free Wi-Fi. Fitted with tiled flooring, air-conditioned rooms combine modern décor and hints of traditional Indian furnishings. Equipped with a flat-screen TV with cable channels and a personal safe, they also include tea/coffee making facilities and a minibar. Private bathrooms come with a hairdryer. Woodbridge-2 is a 30-minute drive from Indira Gandhi International Airport. Parking on the hotel’s premises is free. The hotel has a 24-hour front desk which offers luggage storage and car rental services. Laundry and ticketing services are also available. Located just a 15-minute drive from Indira Gandhi International Airport, Hotel Chaupal Gurgaon offers free Wi-Fi throughout the property and chic, modern rooms with seating areas. The air-conditioned rooms are spacious and equipped with modern amenities such as a plasma TV with satellite channels. Each has a mini refrigerator and a tea/coffee maker. Free soap and shampoo are stocked in all bathrooms. The Chaupal offers a restaurant serving international cuisine. The coffee shop offers authentic Chinese and Indian delicacies, as well as refreshing beverages. At the bar, guests can choose an exotic cocktails or a drink from the extensive wine list. At the front desk, staff is available 24 hours a day. Guests who like to keep fit can enjoy a workout at the fitness centre. DLF City Centre Mall is 3 km away and guests can use the free private parking on site. Featuring a rooftop swimming pool, Dayal Regency is located in the heart of Gurgaon's business area in Sushant Lok 1 development. It has a restaurant offering a wide range of vegetarian recipes. The air-conditioned suites of Dayal are equipped with 32’’ flat-screen TVs with Tata Sky satellite channels and minibars. Free newspapers and free Wi-Fi are provided in each suite. Located a 15-minute drive from New Delhi International Airport, Dayal Regency offers a transfer service for a charge. The staff at the 24-hour reception can help guests arrange rental cars. Along with vegetarian options, the on-site restaurant serves à la carte and buffet non-vegetarian dishes, and provides a 24-hour room service. For an after-dinner drink, the hotel also features a bar. . Featuring home cooked meals and free Wi-Fi, Cinnamon Stays offers air-conditioned rooms with a balcony, a common lounge and a cosy atmosphere. It features a garden and babysitting services. Comfortable and colourful rooms make for a cheerful stay. All rooms come with a TV and private bathroom facilities. Bed & breakfast Cinnamon Stays provides laundry, dry cleaning services and safety deposit of valuables. Tour information and free parking are available. Meals are prepared in the open kitchen, and served in the large dining area. The hotel is a 15-minute drive from Galleria Mall, and a 25-minute drive from Gurgaon Airport. 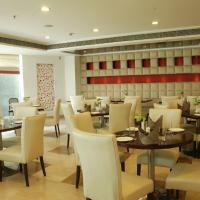 Pitrashish Aashray Hotel is located in Gurgaon, opposite Sahara Mall. It offers basic rooms with free Wi-Fi. Convenience is provided with 24-hour room service and housekeeping. Air-conditioned rooms come with tiled flooring, a TV and a minibar. Attached bathrooms have shower facilities. 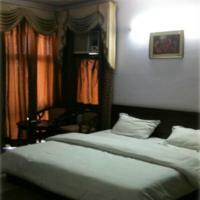 Pitrashish Aashray Hotel is 24 km from Connaught Place and a 30-minute drive from Indira Gandhi International Airport. Free indoor parking is available. Staff at the 24-hour front desk can arrange an airport shuttle and laundry services at an extra charge. Day trips can be organised at the tour desk. Guests can order from the room service menu, which features local, Indian and Western dishes. Hotel Palm Tree is situated 2 km from shopping options in Gurgaon City. Offering air-conditioned rooms with a flat-screen TV and free Wi-Fi, it also houses a fitness room and a restaurant. The hotel is 20 km from Indira Gandhi International Airport. Fitted with tiled flooring, the simply furnished rooms feature a minibar and a writing desk. Private bathrooms come with shower facilities. Painted red and white, the hotel’s restaurant serves local Indian dishes and is open until midnight. In-room dining is possible. Palm Tree’s 24-hour front desk offers luggage storage and car rental facilities. Travel arrangements can be made at the tour desk. On-site parking is free. Sun Villa is located in central Gurgaon, a 3-minute walk from Sahara and MGF malls. It features a fitness centre, restaurant and air-conditioned rooms with a flat-screen TV. Free parking is provided. Guest rooms at Villa Sun offer modern décor and wooden flooring. Each room is fitted with a minibar and an en suite bathroom with shower facilities. A variety of Indian dishes and beverages are served at the restaurant. For convenience, the hotel provides safety deposit boxes at the front desk. Staff at the tour desk can assist with travel and sightseeing bookings. The Sun Villa is 1 km from Sikandarpur Metro Station and 12 km from Indira Gandhi International Airport. Just a 5-minute walk from DLF City Centre Mall, Airport Hotel City Premier offers modern rooms with 24-hour room service and free Wi-Fi access. It houses a business centre. Situated in the business district of Gurgaon, Airport Hotel is 200 metres from the MG Road Metro Station and within a 10-minute walk from PVR Cinemas and the MGF and Senior malls. Indira Gandhi International Airport is a 15-minute drive away. Featuring a private bathroom with a rainshower and hairdryer, air-conditioned rooms offer satellite TV and a personal safe. Tea/coffee making facilities and a minibar are included. Guests can order a variety of Indian and European dishes via the hotel’s 24-hour room service. Vegetarian options are available. Alternatively, eateries can be found within a 2-minute walk of the hotel. Airport Hotel City Premier has a 24-hour front desk which can assist with laundry or shuttle services. Day trips can be arranged at the tour desk. Drivers can park on-site for free. Sarai is 100 metres from the Signature Towers in South City, and 2.5 km from the IFFCO Chowk Metro Station. It offers a rooftop restaurant and free parking on site. Air-conditioned guest rooms are fitted with cable television and have a seating area. The en suite bathroom comes with toiletries and hot/cold shower facilities. Laundry and dry cleaning services are available. Airport transfers and shuttle services can be arranged at a charge. Sarai Cafe, the rooftop restaurant, serves a variety of Indian and continental dishes for breakfast, lunch and dinner. Sarai is 20 km from the Indira Gandhi International Airport. 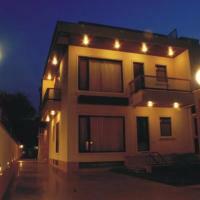 Soni Villa is located in Gurgaon, 2 km from MG Road Metro Station. It features a restaurant, 24-hour front desk and air-conditioned rooms with a TV. Free Wi-Fi is provided. Villa Soni is 2.5 km from Sahara Mall and a 5-minute drive from the Cyber Green Area. Indira Gandhi International Airport is 18 km away. Rooms at the hotel come with wooden furnishings and have plenty of natural light. All are fitted with a seating area, work desk and private bathroom with toiletries. The restaurant serves a selection of local, Chinese and European dishes. Room service is available upon request. To relax, guests can play a game of table tennis. The hotel provides ticketing and airport shuttle services. Day trips and sightseeing arrangements can be made at the tour desk. Krishna Coddle Residency is located at the heart of Gurgaon’s business zone, Sushant Lok, 750 metres from the IFFCO Chowk Metro Station. It offers a 24-hour room service and free parking on site. Air-conditioned guest rooms are fitted with a fridge, ironing facilities and cable television. The en suite bathroom comes with toiletries and shower. Laundry and dry cleaning services are available. Airport transfer and shuttle services can be requested at a charge. The hotel has a kitchen which can provide meals to guests to dine in the comfort of their own rooms. Both vegetarian and non-vegetarian options are available. Residency Krishna Coddle is 1 km from DLF City Centre Mall and 1.8 km from the Sushant Shopping Arcade. Indira Gandhi International Airport is 21 km away. Shyama Sojourn is in the business area of Gurgaon, 750 metres from IFFCO Chwok Metro Station and 2.5 km from the MGF Metropolitan Mall. It offers a 24-hour room service and free parking on site. Air-conditioned guest rooms are fitted with a TV with cable channels. The en suite bathroom comes with toiletries and shower facilities. Laundry and dry cleaning services are offered. The tour desk can assist with making travel arrangements. Luggage storage can be found at the 24-hour front desk. Guests can arrange for food to be delivered to their rooms. Both vegetarian and non-vegetarian options are available. Sojourn Shyama is 1 km from the DLF City Centre Mall and 20.3 km from Indira Gandhi International Airport. Park Plaza is right next to the hotel. Sai Village is centrally located in Gurgaon, 1.7 km from Reheja Mall and 5 km from HUDA City Centre Metro Station. It offers furnished apartments with a well-equipped kitchen. Free parking is provided on site. Air-conditioned rooms are fitted with a washing machine, a DVD player and a flat-screen TV with cable channels. Each room also has a balcony and a seating area. The en suite bathroom comes with toiletries and shower. The staff at the tour desk can assist with making travel arrangements. Shuttle services and cab hires are available at a charge. The hotel has a 24-hour kitchen which provides in-room meals. Indian and Continental dishes are offered. Both vegetarian and non-vegetarians options are available. Village Sai is 21 km from Indira Gandhi International Airport. 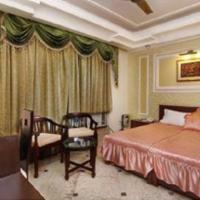 Hotel Queens Residency is 7 km from Gurgaon Railway Station and 16 km from the Qutab Minar. It offers a restaurant, a 24-hour room service and free parking on site. Air-conditioned guest rooms are fitted with a work desk and cable television. All rooms feature Italian marble flooring, and have a seating area. The en suite bathroom comes with herbal toiletries. The staff at the tour desk can assist with making travel arrangements. Laundry and dry cleaning services are offered. The on site restaurant serves a selection of international dishes. Both vegetarian and non-vegetarian options are available. A 24-hour room service allows guests to enjoy meals in the comfort of their own rooms. Queens Residency Hotel is within of 20 km of Gandhi International Airport and the Dhaula Kuan. New Delhi Railway Station is 32 km away. Located 1.7 km from Sahara Mall, Regalia Residency offers free parking and free Wi-Fi throughout the hotel. It has a 24-hour front desk and room service. Rooms are fitted with a flat-screen cable TV and tea/coffee-making facilities. Regalia Residency is located 1.3 km from Sikandarpur Metro Station and 2.5 km from Cyber Green. Indira Gandhi International Airport is 17.7 km away. Rooms are fitted with both air conditioning and a fan. A safe, toiletries and slippers are provided. Guests can make use of the business centre to do work or head for a sightseeing trip organised by the tour desk. Currency exchange, laundry and dry cleaning services are available. A variety of Indian and European dishes are served in the restaurant. Both vegetarian and non-vegetarian options are available.